These vibrant Waldorf and Montessori inspired counting bowls are full of fun and learning for children. 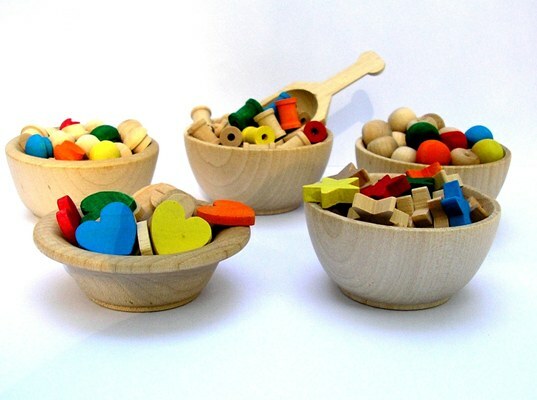 Each non-toxic bowl is made by Wee Wood Natural Toys and can be used for counting, pouring, shape sorting, learning colors, making up stories, or as accessories for little doll friends. You may choose a bowl full of stars, apples, spools, hearts or mushrooms. All the various shapes are painted in 5 primary colors with non-toxic paint and sealed with a non-toxic and hypoallergenic sealant — or you can order them unpainted and natural. Each little bowl comes with a tiny scoop and a cloth carrying bag. All of Wee Wood Natural Toys’ products and the materials used to make their bowls are non-toxic and natural, and the company uses recycled shipping & packaging materials. *Note that the small wooden pieces in these sets may pose a choking hazard for little ones under the age of three years. + Single Bowl $15 of mini hearts, stars, apples, spools, or mushrooms, bowl and scoop, plus a cloth carry bag. + Wee Wood Large Set $50; includes 5 bowls, 5 scoops, plus one set each of hearts, mushrooms, spools, stars and apples. I like this!! Waldorf, wooden toys, natural, and not too shabby price! Thanks! These vibrant Waldorf and Montessori inspired counting bowls are full of fun and learning for children. Each non-toxic bowl is made by Wee Wood Natural Toys and can be used for counting, pouring, shape sorting, learning colors, making up stories, or as accessories for little doll friends. You may choose a bowl full of stars, apples, spools, hearts or mushrooms. All the various shapes are painted in 5 primary colors with non-toxic paint and sealed with a non-toxic and hypoallergenic sealant -- or you can order them unpainted and natural. Each little bowl comes with a tiny scoop and a cloth carrying bag. All of Wee Wood Natural Toys� products and the materials used to make their bowls are non-toxic and natural, and the company uses recycled shipping & packaging materials. *Note that the small wooden pieces in these sets may pose a choking hazard for little ones under the age of three years.